Microscopes have been in use in various forms for more than 3,000 years. The first microscopes were extremely simple magnifiers made of globes of water-filled glass or chips of transparent crystal. Ancient Romans were known to use solid, bead-like glass magnifiers. Emperor Nero ( A.D. 37-68) often used a bit of cut emerald to help his poor vision. Compound microscopes are found in almost all medical laboratories and in many industrial research centers. The first lenses that were used in primitive eyeglasses were manufactured in Europe and China in the late thirteenth century. By this time lenscrafters realized that most clear glass or crystal could be ground into a certain shape (generally with the edges thinner than the center) to produce a magnifying effect. All of these single-lens magnifiers are called simple micro-scopes. Until the turn of the seventeenth century, most simple microscopes could provide a magnification of 10 power (magnifying a specimen to ten times its diameter). About this time Dutch draper and amateur optician Antoni van Leeuwenhoek (1632-1723) began constructing magnifying lenses of his own. Though still relying upon single lenses, Leeuwenhoek's unparalleled grinding skill produced microscopes of very high power, with magnifications ranging to 500 power. In order to achieve such results, Leeuwenhoek manufactured extremely small lenses, some as tiny as the head of a pin. Because of the very short focal length of these lenses (focal length is the distance of focus from the object to the lens), the microscope had to be held only a fraction of an inch away from both the observed specimen and the observer's eye. Through his minute lenses Leeuwenhoek observed tiny "animalcules" (what we now know as bacteria and protozoa) for the first time. His findings earned him international acclaim, and the simple microscopes he designed are still among the best-crafted. The limitations of the single-lens magnifier were apparent to scientists. They labored to develop a practical system to increase microscope magnification. The next breakthrough in microscopy was the invention of the compound microscope. While the origin of this device and the identity of its inventor are the subject of some debate, credit for the invention of the compound microscope has generally been given to Dutch optician Zacharias Janssen (1580-circa 1638). Around 1590 Janssen reportedly stumbled upon an idea for a multiple-lens microscope design, which he then constructed. Though he affirmed its ability, no record exists of Janssen actually using his invention. It is now believed that Janssen's son fabricated the story. A photomicroscope, one of the many modern variations of the simple microscope. Meanwhile, Dutch scientist Cornelius Drebbel claimed that he had constructed the first compound microscope in 1619. The astronomer Galileo (1564-1642) also reported using a two-lens microscope to examine and describe the eye of an insect. Regardless of its inventor the design of the original compound microscope is very similar to those used today. Two or more lenses are housed in a long tube. Individually, none of the lenses are particularly powerful. The image produced by the first lens is further magnified by the second (and the third and fourth, in a multiple-lens system), ultimately producing a greatly enlarged image. In addition, multiple lenses allow for a much longer focal length. This permits both the specimen and the viewing eye to be placed at a greater distance from the lenses. The first scientist to further improve the compound design was the Englishman Robert Hooke. Hooke was the first researcher to use a microscope to observe the structure of plants. He found them to consist of tiny walled "chambers" that he called cells. After Hooke, little advancement occurred in microscopy until the collaborative work of German manufacturer of optical glass Carl Zeiss (1816-1888) and German physicist Ernst Abbe (1840-1905) in the mid-1800s. Abbe, generally recognized as the first optical engineer, took over design duties at the Zeiss Optical Works in 1876. The scientific instruments that resulted from Zeiss and Abbe's collaboration set new standards for optical equipment. Among their inventions were lenses that corrected blurring and color aberrations (defects or imperfections). By the twentieth century the essential design and shape of the compound microscope had evolved into the same form we know today. 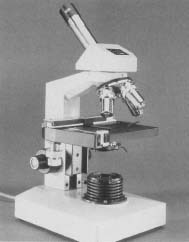 Microscopes used in schools and small laboratories can achieve magnification of up to 400 power. More advanced microscopes used in research laboratories can magnify a specimen to almost 1000 power. These research microscopes often have binocular eyepieces, which rely upon a series of prisms to split the image so that it may be viewed with both eyes. Even trinocular microscopes have been designed, which create a third image for a camera to view. The practical limit for any compound microscope is 2,500 power. In the twentieth century this limited magnification capability frustrated scientists who were anxious to view the world on submicroscopic and subatomic levels. In 1931 German scientist Ernst Ruska (1906-1988) constructed the electron microscope, thus permitting such investigations. Designed much like a compound microscope, the electron microscope uses a beam of electrons focused through magnetic lenses. Since electrons possess much smaller wavelengths than does visible light, the electron microscope can provide much higher magnification than light-based instruments. Through electron microscopes scientists first viewed strands of DNA. 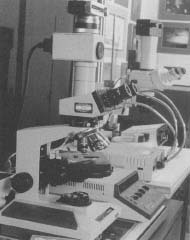 Since Ruska's invention, instruments such as the scanning tunneling microscope and the field ion microscope have been developed. These devices are capable of observing the activities and structures of individual atoms. your page helps a lot...but please add more info.more detailed! wow much info. i like it this is good info i used this a lot. and realy help those who realy need's help in science and biology.